Like most of you, I am also a Brazilian Wax virgin...until I decided to finally have it done a month before I left Manila. A lot of my friends have been telling me to undergo waxing, but the thought of spreading your legs in front of a total stranger and getting your hairs down there pulled by that stranger was something I didn't know I can do. Until one day, while walking around Greenbelt 5 and left with nothing to do, I finally decided to do it and I'm just so glad I chose Strip to de-virginize me and welcome me into the world of waxing. And like what my friends say, it's indeed true that once you've tried waxing, you'll never go back to shaving. I was supposed to try another waxing salon before I leave but I decided to go back to Strip. So yeah, my first two wax sessions were with Strip and both are really good experiences. When I got here in Dubai, I just knew that I wouldn't have a hard time looking for waxing salons. I'm pretty sure there would be lots around, given that spending time at the beach is one of the favorite past times here. And besides, brazilian waxing is not something new anymore. My former officemate (also a Pinay) have been doing it for years, and most of my friends have tried it too. I was actually the late bloomer, hahaha. Looking online, I found Sisters Beauty Lounge. It's a full concept beauty lounge that can meet all your beauty needs. They offer hair and nail services, facials, massages, body treatments and yes, hair removal. They have a lot of branches and the nearest to me would be their branch at MOE. It's easy to find them too. Just go to the ground level of Fashion Dome area, take the exit and then turn right. Anyways, when I entered the salon, I was immediately greeted with a Kabayan (that's how we call fellow Pinoys/Pinays here in Dubai). The place is compact, but I can see that there was a lot of customers at that time. I was told that there are no slots available at that time for waxing but the 5pm slot is open. I reserved the 5pm slot, and went back to the mall to grab some snack. I was at the lounge again five minutes before my schedule. Now, they offer two types of wax: the usual and the Lycon wax. The latter is said to be less painful, and if you have sensitive skin, this would suit you more. It's also a bit more expensive than the usual. It's 160AED and the usual wax is I think 130AED. I decided to get the Lycon to see if it's really different from what I've been used to for my past two sessions at The Strip. I went back 5 minutes before 5pm and though I didn't really feel the need to pee, I asked the receptionist if they have a CR so I can, you know...wash my down there. Unfortunately, they don't, so I had to go back to the mall and find one. Good thing too that the toilets here have a bidet and there's always a tissue..well, at least in the malls I've gone to. When I went back, I was then ushered into the waxing room and fortunately, the waxing attendant is also a Kabayan. When we got into the room, she asked me to take off my undies. What surprised me was that she just stood there, watching me. Well, on the first two times I had a brazilian wax in Manila, the attendant steps out of the room first then you'll just have to call her back in once you are ready. I know it's not even half as embarrassing as the actual waxing but then again, I'd appreciate it more if I'm given a bit of privacy first. Probably, she would've stepped out if I asked her to. Another thing that I've noticed during the process is that, each time the wax is stripped, the attendant would only press her hand (she's wearing gloves, by the way) onto the area. On my first two sessions, a cold compress follows after the wax is stripped. I think that is a lot more helpful to relieve the sting/pain. As for the less pain, I think the wax from Strip is just the same with what I had: the Lycon wax. I did experience the same amount of sting/pain so it makes me wonder how it is to get the usual wax. Maybe I'll try that next...or maybe not! Hahaha. I was done in less than 30 minutes and well, the attendant did step out of the room after so I had some privacy while I slip into my undies again. I'm used to giving tips, so I did give her some. She also handed me a brochure with the prices just in case I would want to avail some of their other services next time. By the way, I asked if I can take photos of the room and the materials but she said she wasn't sure if that's okay so I didn't bother trying. I don't want her to get into trouble! It would be nice though if I can take some photos so I can share with you how clean and orderly the salon is. The salon is clean and orderly. Hygienic. They don't double dip the spatulas and their beds have a paper cover for you to lay on. Aside from waxing, the salon offers other services. It's a one-stop-beauty shop! No toilet. But I guess it's because this specific branch is quite small and maybe their larger branches have their own toilet inside. Also, maybe this is probably because it's located in a mall where there are lots of toilets? The attendant not giving me time to ready myself before starting with the procedure. I would've appreciated it more if she'd let me just call her back in. Expensive. Well, comparing it to Strip which is already a bit steep than other waxing salons in Manila (Php1200), their regular wax is even pricier at almost Php1500 when converted to Peso. Yes. But I'd like to explore other salons first that offer waxing services too so I can compare and share it with you. I'd love to check out cheaper ones, but of course, still offer great service. 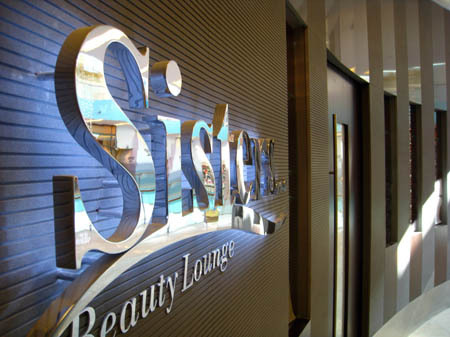 To know more about Sisters Beauty Lounge and where their other branches are, check out their website. You can also like their Facebook page and/or follow them on Twitter. Have you tried Brazilian waxing here in Dubai? Do share so I would know where to go next! I would probably get nosebleeds if I try Brazilian. HAHA! And I'm so shy to let anyone else touch Hairy Potter. LOLS!! If you use a low quality razor and gel for remove hair it's does not help you comfortable shaving.You can use best safety razor shaving blades which is help you safety and comfortable shaving. Dang, that is pretty pricy for the Philippines but you should see how much it costs to get one done at the best place to get Brazilian wax in Manhattan. I mean, it's worth it, but it's still really expensive!